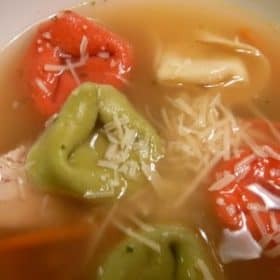 Lisa at Jersey Girl Cooks recently had this soup recipe on her blog. It is so easy and delicious, it’s going to be a regular at our house. I didn’t have the spinach it called for and changed it up a bit. I’ve posted my version of the recipe. I’ll be on vacation until December and probably won’t have time to blog. Although, I am a bit obsessed with checking email on vacation and will probably stop by my blog and read posts. I’ll post all about it when I return. In the meantime, enjoy the soup and thanks for visiting! In a large pot, heat stock until boiling. Add chicken and shredded carrots. When carrots are tender add tortellini. Cook tortellini according to time of package instructions. Add frozen peas. When peas are warm, add salt and pepper to taste. Serve with grated cheese on top. Makes 4 to 6 servings.